There is a beating resonance about this whole comic book, and the four creators so inconspicuously listed atop the book sing with one voice. Quite often with works of literature and art, you take away something personal from it that you hear when experiencing it. If you read Kieron Gillen’s notes, then you can listen to him verbalising the stream of consciousness that emanates from his thoughts, making you wonder how he actually lands it on the page. 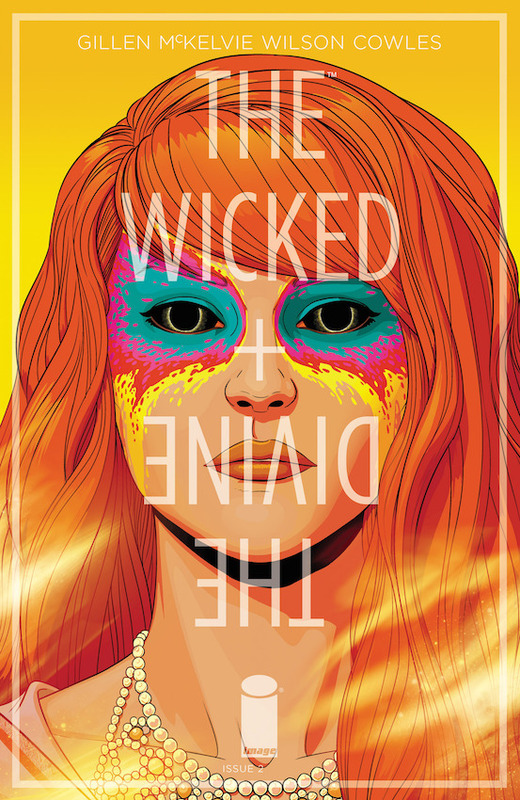 And then Jamie McKelvie has to take all that information and bring it to life, and that is what is happening right here. The close up head shots of the characters of the book have become the mainstay of the covers, but I particularly love this one. It is the one that looks most heavenly, divine if you will. The expressionless face strikes a discord with the beauteous image before us. Is she merely a stunningly beautiful facade with little behind her voice and appearance? The eyes are dark and are almost void of emotion or even life, but her face is of aesthetic pleasure. The hair flows ceremoniously and perfectly and her make up is that of almost regality. Similar to a peacock displaying her glorious colours to show how pretty she is. The bedazzling jewels almost blind the reader, which is where Matt Wilson comes into action. The brightness and luminance of the cover are abundantly seraphic with a golden hue. Her image is all important, hence why it takes up the whole page and the title/credits are white and shaded as to not cause too much obstruction to her face. The fact that the title is sprawled over the cover means that you are not even allowed to adjust your gaze away from her to find out what the comic is even called. Now what do you take away from this cover, or even the comic? To sell your soul for a modicum of fame that leaves you an empty but beautiful shell, what you actually were all along. This applies to many a band and popular music artist and that is what I see when I look at Amaterasu, but I just cannot stop looking at her.